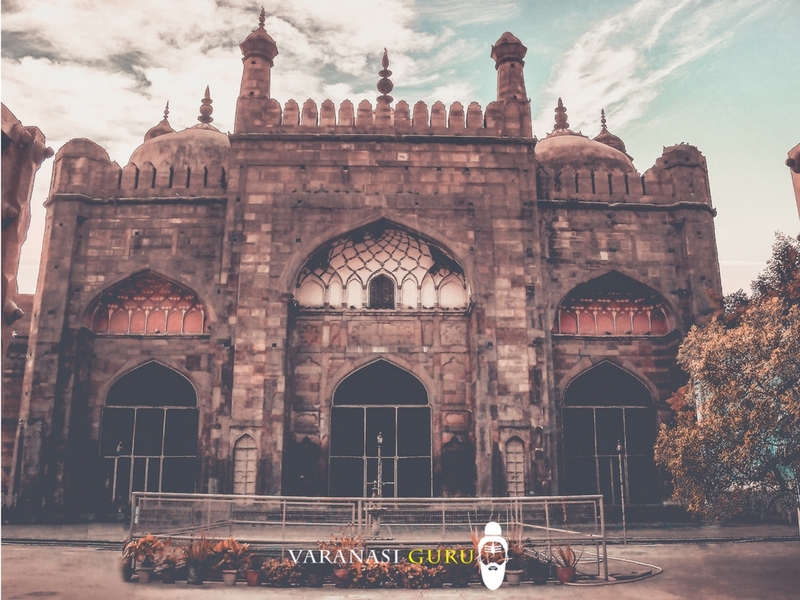 Located on the Panchganga Ghat, Alamgir mosque is one of the most picturesque locations in Varanasi. The mysterious architecture towering right above the Panchganga Ghat has attracted the attention of millions since the 17th century. It’s rustic look and gigantic domes stand out against all the contemporary architectures developed around it. Known by the name of Beni Madhav Ka Darera or Aurangzeb’s Mosque this architecture holds significant importance in the books of history. Alamgir mosque is located at the place where once stood a temple of Lord Vishnu( Beni Madhav Ka Darera). The French merchant Jean Baptiste Tavernier who made many voyages to India was awestruck by the beauty of the temple. He mentioned the temple as “the great pagoda” in his travel account. In 1663 Aurangzeb captured the Varanasi and demolished the Kashi Vishwanath Temple in 1669. Bindu Madhav Temple was also destroyed in 1673 and Aurangzeb built the Alamgir mosque on the ruins of the temple. The foundation of the temple was used for the construction of the mosque which is also believed to be as deep as the height of it. Aurangzeb also added 2 minarets and 3 domes to give the structure a striking look. Each minaret was 163 feet long and was equipped with a staircase and a balcony. However, the minarets couldn’t withstand the test of time and in the 19th century, an English scholar James Prinsep had to restore them. In 1948 one of the minarets collapsed killing a few people around the time of the floods. Later the govt pulled down the other minaret due to security reasons. Today, the Alamgir mosque stands atop the Panchganga Ghat. Its eye-catching minarets are gone but it still manages to steal the charm. The long narrow stairway next to Shri math leads to the mosque. The climb is exhausting but the view and feelings after reaching there are definitely worth every step. Upon entering the vicinity you will confront the glorious structure with a tree on your right side and a small pond with a fountain in front of you. The pond has emerald green water and one can often spot pigeons bathing and drinking water from it. Move toward the left side and you will spot a small stair descending to the balcony. The view from here is often compared to the marine drive of Mumbai. The Alamgir Mosque is located on Panchganga Ghat. The best way to reach Alamagir Mosque is by walking through the ghats. One can walk towards the Panchganga from Manikarnika Ghat or can take a boat from any ghat to the Panchganga Ghat.